Explain the different ADA accessibility guidelines as they apply to sliding doors. Select the right combination of system components to create a safe sliding hardware system. Describe how the use of glass sliding doors and walls enables access to daylight and views deeper into the space, improving occupant well-being and creating energy savings opportunities. Apply best practices to specify the most common sliding hardware systems: single-panel door systems, telescoping door systems, folding wall systems, and stacking wall systems. Sliding door and wall systems are more space efficient and offer greater space flexibility than conventional pivot doors and stationary walls. These sliding hardware systems are designed to provide an effective barrier, when necessary, in a fraction of the footprint required by traditional solutions, and then enable occupants to slide the door or wall out of the way when the space division is no longer needed. This approach to doors and walls also offers advantages in satisfying accessibility requirements mandated by the Americans with Disabilities Act (ADA) and green building initiatives. Sliding systems are considered easier to manipulate and maneuver around than swinging doors, and subsequently require less maneuvering clearance than their pivoting counterparts. Sliding glass panels can be used to create a space barrier without blocking daylight from traveling deeper into a space or obstructing views to the outdoors. This is particularly useful when trying to maximize the presence of daylight and views in the interior. All photos courtesy of Hawa Group Americas Inc. Sliding glass door systems enable designers to divide the interior space as needed, without obstructing access to daylight and views. 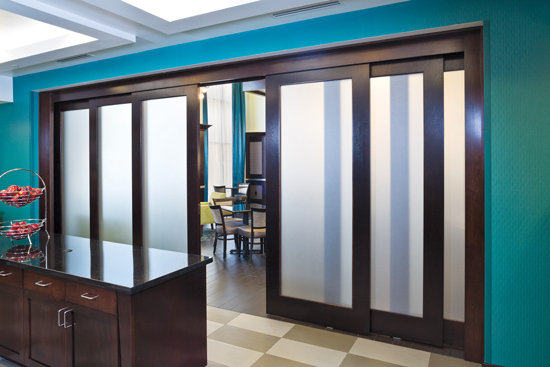 There are many types of sliding door and wall systems now available that offer innovative solutions for designers looking to do more with less space and increase the overall flexibility of any interior. Sliding doors can be used in place of hinged or pivot doors, providing the same space division and functionality with a much smaller operational footprint and a large range of available door widths. The most basic sliding door system is a single straight-sliding door on a single track. When opened, these doors can be recessed inside the wall to be concealed from view or slide out of the way along the outside wall, remaining visible in both open and closed positions. These space-efficient barriers are an excellent and innovative solution in office and hospitality applications. Bi-parting door systems consist of two door panels on a single track. These systems are opened from the center by pushing the door panels in opposing directions, one to the right and the other to the left. These systems can be operated individually or interconnected for simultaneous operation with a belt and pulley mechanism, which provides a smooth and elegant experience. Bi-passing door systems employ multiple tracks and multiple bi-directional panels. These multifaceted systems are often used to conceal wide storage areas that benefit from multiple access points, such as the libraries found in architectural firms, hotel closets, residential closets, and AV areas in large conference rooms and classrooms. Telescoping door systems are designed to smoothly retract and extend multiple door panels moving in the same direction. Panels in a telescoping door system can be interconnected with a belt and pulley mechanism or with entrainment strips. While the operation of the belt and pulley system creates a very smooth and elegant experience for the operator, there are limits on the quantity, weight, and width of the doors that can be operated this way. The use of entrainment strips can offer similar telescoping panel configurations with fewer limitations on door size and weight, but may result in maintenance issues without proper operation. Telescoping door systems smoothly retract and extend multiple door panels moving in the same direction, providing an elegant barrier solution for large openings. Folding wall systems offer a dynamic alternative to standard stationary walls. They live on a single track with panels that are connected to one another with hinges and fold accordian-style into and out of the space. Each folding wall system may be comprised of up to nine panels. These systems are a good solution for the simple and straightforward task of subdividing one large space into two smaller spaces with one straight wall. When subdividing a space, there is often a need to go back and forth between the two smaller spaces. A pivot door can be incorporated into a folding wall system, offering easy access to both spaces when the wall is deployed. When not in use, the pivot door can fold up with the rest of the folding system or, depending upon the configuration of the system, it can pivot and park against the wall opposite to the larger stack. Stacking wall systems provide unparalleled flexibility for moveable walls. The panels move independently, into and out of the space, and then stack like dominos at the end of the track when not in use. The tracks can incorporate curves and corners to best fit any desired application. Panels in stacking wall systems can be larger and heavier than the panels in folding wall systems, reaching up to 4 or 5 feet wide, 10 feet tall, and more than 300 pounds in weight. They may also be used for smaller countertop-height systems, which may be handy for security or concealment. Panels within a stacking system can even be different sizes to create a special aesthetic or accommodate a unique design element. These systems can effectively create unique and custom environments within a larger common space, such as a hotel lobby that houses a variety of stores and services, or a restaurant that morphs to accommodate a private event. Stacking walls give restaurants the flexibility to maintain a large and open general dining area and morph to accommodate special private events, when booked. These sliding systems may not be high-tech, but good design and high-quality materials make all the difference in delivering silent, smooth, and easy operation that will last for a very long time. 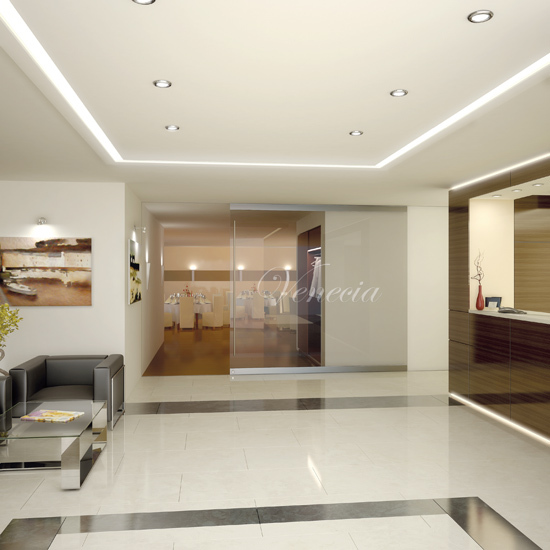 The panels are the physical material that create the door or are combined to create the wall that divides the space. Panels can be made of a variety of materials, such as wood, glass, and metal, and some composite materials, including acrylics. The track used for sliding hardware systems is often either steel or aluminum. These tracks are available in a variety of grades, thicknesses, and finishes. While the type of finish is often mostly aesthetic, the type of the material and the thickness can affect the performance of the track. Thinner tracks can warp over time, while thicker tracks tend to hold their shape more reliably. An anodized aluminum track is one of the most durable types of track available. Track for sliding hardware systems is also available in several shapes. Three of the most common track shapes are the box shape, the C shape, and the E shape. Advancements in the manufacturing process of the box shape have made this style of track less prone to contamination and have also made it possible to prevent the sliding hardware system from jumping the track. C-shaped track can be bent, allowing panels to traverse along a curved path. E-shaped track also accommodates curved applications and is equipped to handle lateral loads. The trolley is a wheeled carriage that travels along the track and carries the weight of the panel. Today, trolleys often have plastic or plastic-coated wheels for quiet rolling. It should be noted that there are a variety of trolley styles and shapes, including, but not limited to: two-wheel, four-wheel, and multi-plane (where wheels are placed on both the vertical and horizontal planes) configurations. When selecting the right trolley for a project, it is important to identify whether or not the system will need to travel along a radius or accommodate any lateral movement or sway. Multi-plane trolleys are designed to travel around curves and help control lateral motion, whereas trolleys designed to travel in a straight line may be damaged by lateral movement. It is also important to note that the size of the trolley will change based on the size or weight of the panel it is carrying. The box-shaped track completely encloses the trolley, making it impossible for the system to jump the track. Advancements in both the design of the track and the quality of the trolley wheels have resulted in sliding systems that are smoother, more silent, more durable, and easier to operate than their predecessors. For example, in the past, the trolley would often become misaligned or disengage from the track, causing the sliding door to fall off of the track. Today, the box-shaped track completely encloses the trolley, making misalignment and disengagement impossible, and delivering a reliably smooth sliding experience year after year. When specifying a sliding system, an important consideration is the length of the top track. Top tracks are available in standard lengths up to about 19 feet. For systems that require longer top tracks, special care should be taken to ensure a precisely connected track. Small gaps in the joints of the track can, and often do, damage the wheel surface of the trolley. Over time, this causes the system to be noisy and, more importantly, can increase the rolling resistance, making the panels harder to open and close. In some cases, the increase in rolling resistance can be substantial enough to cause the system to fail to meet operational force guidelines mandated by the ADA. The ADA requires that hinged doors and sliding doors be able to be operated with a maximum 5-pound force (lbf). Some manufacturers offer top tracks that employ locator pins to provide precise connections. These enhanced tracks will allow trolleys to travel over connections with minimal or no damage. The suspension connects the individual hardware panels to the trolley and can be visible or concealed. Usually, the suspension includes a hanger bolt, which explains why this component is also commonly referred to as the hanger. It is important to ensure that the suspension mount selected is appropriate for the type of panel that is being mounted. 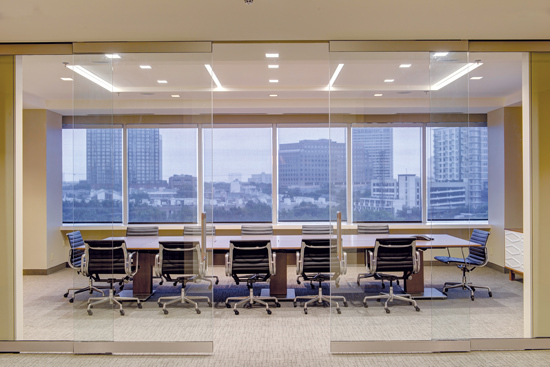 Glass panels require different considerations than wood panels and metal panels. A guide prevents lateral movement, or sway, of the panel. This means that it keeps the panels from swinging back and forth or rattling in response to vibration in the space or airflow. While there are many reasons and many application types that warrant the use of these devices, safety is the most important benefit that these components provide. 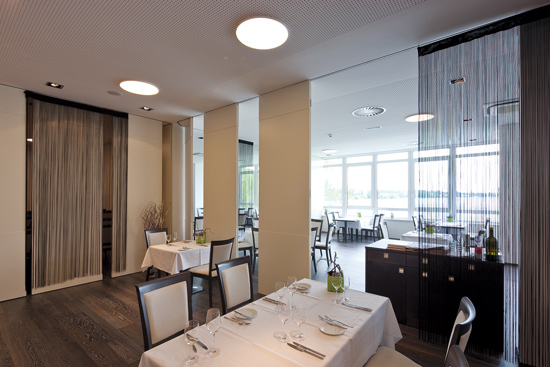 Guides may be mounted to the floor, an adjacent wall or sliding panel, or directly to the bottom of a sliding panel. Panel-mounted guides are often used to control the motion of very wide and very heavy panels, which can generate larger amounts of lateral movement as they slide. As a general rule, panels sliding further than their own width or larger than 5 feet wide should be controlled by a panel-mounted guide. These guides should also be considered if the height-to-width ratio of the panel is too large to avoid panel sway. The control that guides provide is important, because uncontrolled panel motion can cause damage to the wall, trolley, suspension, or hanger bolt. Damaged components could cause the panel to fall and result in injury. A panel-mounted guide is comprised of the physical guide mechanism, which is mounted to the bottom of a panel, and a floor-mounted guide channel into which the guide fits. 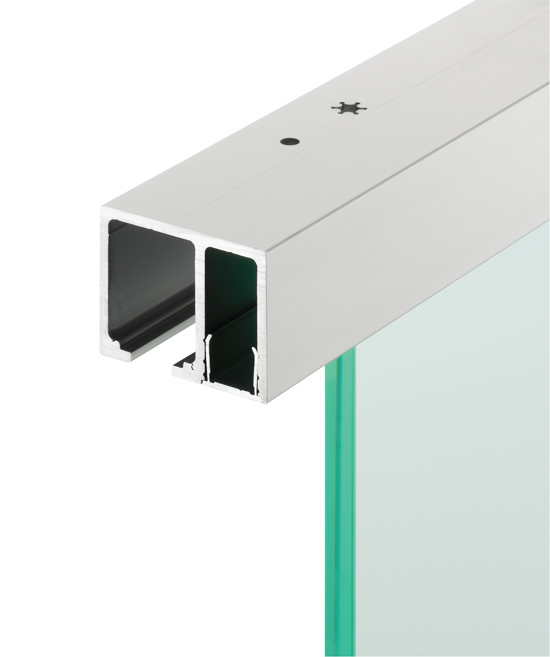 A floor-mounted guide provides a barrier-free threshold because the guide channel lives in the bottom of the panel and is concealed from view, rather than being mounted to the floor. The physical guide mechanism is either mounted to the floor or an adjacent wall and is concealed by the door or panel. Sliding systems with large or heavy panels should include a door guide to prevent panel sway and protect the integrity of the system. Doorstops keep the sliding door panels from sliding too far. Door stops may be placed inside the track and mounted on the floor or wall. Whenever possible, it is advisable to place the doorstop as close to the vertical center of the panel as possible or at the top and bottom to stop the panel simultaneously. Inertia will cause the door to rack, or rotate vertically, if the stop is located only at the top. Over time, the racking motion may cause some additional wear and tear on the sliding system.